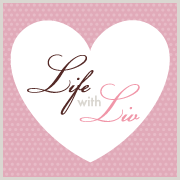 Life with Liv: National Picnic week - 13th - 21st of June. Next Saturday marks the beginning of National Picnic Week 2015. Why not take advantage and get together with your Family and Friends - even a rainy indoor picnic can be fantastic fun! The official Sponsor of National Picnic week is Yorkshires favourite Seabrook Crisps. 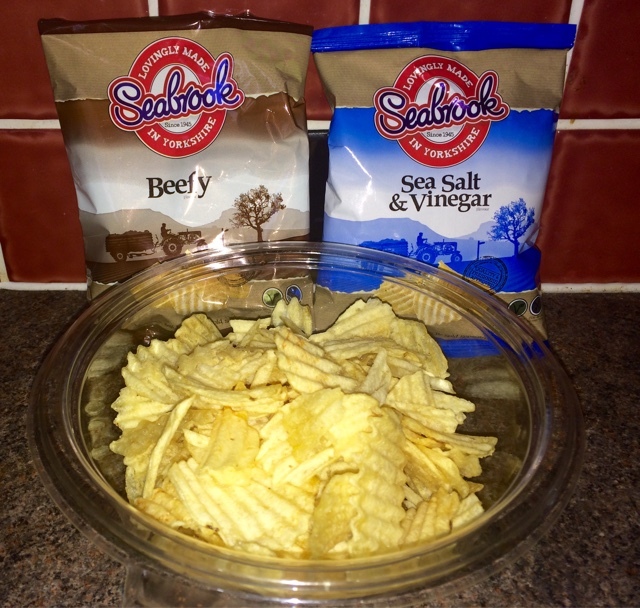 Seabrook have been bringing us honest and simple flavours since 1945 when they began producing Britain's first crinkle cut crisp. 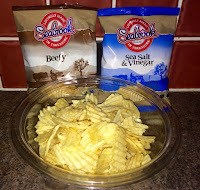 Crunchy and made form Britain's finest ingredients, Seabrook crisps are a firm favourite of Livs and perfect for a picnic. You can't have a picnic without a picnic basket! 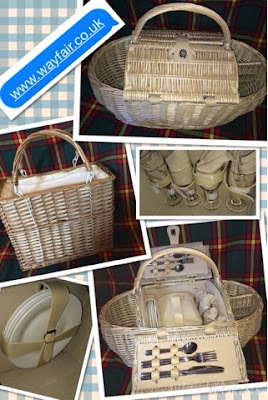 The lovely people at Wayfair.co.uk were ever so kind to send us this beautiful wicker AlpenHome 4 person boat hamper picnic set - £98.99. This wicker 4 Person Boat Hamper Picnic Basket, comes full of fantastic quality accessories including 4 18cm porcelain plates, 4 stainless steel knives, forks and teaspoons, 4 wine glasses, corkscrew/bottle opener, cooler bag and 4 napkins. Finished beautifully with a faux leather trim in brown colour, a securing strap and an antique wash finish. 42cm High, 60cm Wide,30cm Deep and Overall weight 9 kilogram. We were also sent this AlpenHome cooler basket - £46.55. In the same lovely wicker finish, this cooler basket has a zipped top to prevent anything falling out or insects getting in. Dimensions: 21cm High, 42cm Wide, 37cm Deep. The quality of both items is outstanding. With attention to detail and a lovely cottage feel, these will see you through many years of Family picnics. 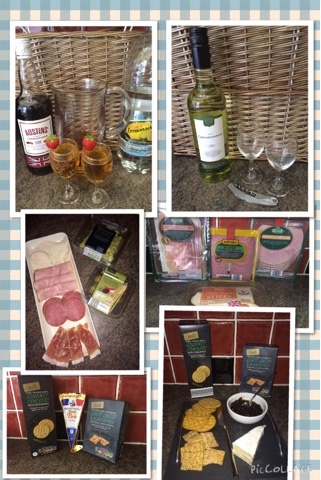 Create the perfect picnic with Aldi. 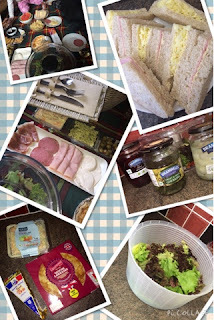 If you are a regular reader / follower of Social Media, you will know we are huge Aldi lovers here. The quality and price are second to none in my opinion. With this in mind I set about buying enough food and drinks for 6 people with a £40 budget. Here is how I got on! All for under £40 and plenty of left overs too! I would definitely recommend you get your picnic essentials from Aldi this year. We were also sent some other lovely goodies so were very spoiled indeed! The first thing I noticed was the modern design of the 500ml bottles, very clean and simple. I am usually very picky about fruit ciders as I am not a sweet toothed person and find them far too sugary, so I was pleasantly surprised when I tried these as they are still fresh and fruity without tasting like a bottle of sugar. The biggest hit with everyone was the Lemon & Ginger, absolutely delicious over some ice. We will definitely be stocking up on these. Meaning "love" in Scandinavian, älska is 100% natural and suitable for Vegans. With an ABV of 4% älska is available at independent retailers and bars nationwide. To find out more about älska and The Swedish Cider Company visit www.alskacider.com. These lovely Raspberry lemonade and Traditional lemonade Heartsease Farm Sparkling Premium Pressés look fantastic and went down a storm as an alternative for the Adults. Made from only natural ingredients, the carefully selected fruit is then blended with spring water from the farm itself! They really were delicious, the Raspberry lemonade almost tasted like sherbet and the Traditional lemonade was lovely and sharp. 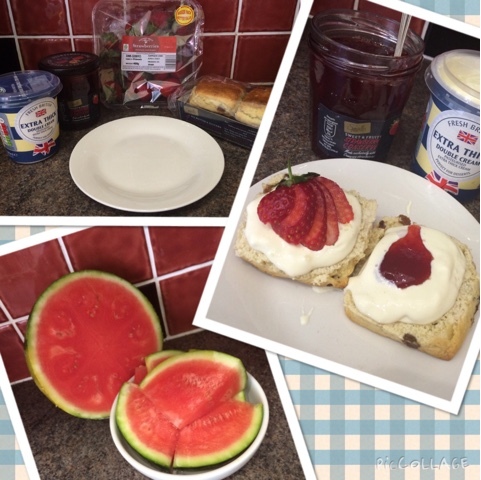 They were a lovely treat and very refreshing! The perfect non-alcoholic tipple for a Summers picnic. 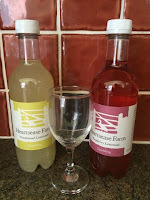 Also available In: Blackcurrant Crush, Elderflower, Fiery Ginger Beer and St. Clements. In a Single Serve 330ml glass bottle, a 425ml plastic bottle and a larger 750ml table sized bottle for sharing. Shaken Udder Milkshakes and Shaken Udder Kids Milkshakes. 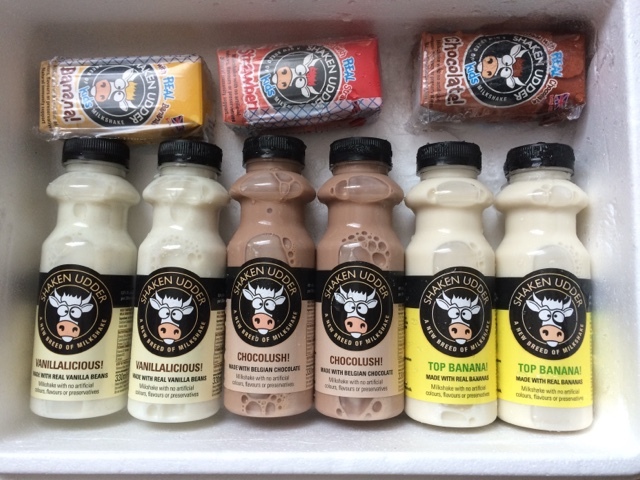 Liv was very kindly sent a huge selection of fabulous Shaken Udder Milkshakes and Shaken Udder Kids Milkshakes. She doesn't like anything fizzy (thankfully!) so these are perfect for her at a picnic. 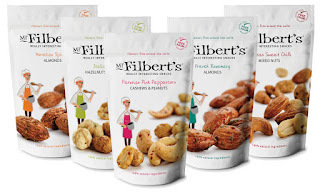 Created in 2004, this brand is going from strength to strength, hardly surprising with their healthy & delicious product. Liv has enjoyed them all but particularly like the bottled Vanilla, I can understand why just looking at it, it looks very delicious and the vanilla seeds are clearly visible. I had a little taste - purely so I could describe it of course! And can tell you it was so creamy and delicious I could have happily finished the bottle myself! Low in fat and sugar and 100% natural, these milkshakes would be a welcome addition to any occasion, for Adults and Children alike. 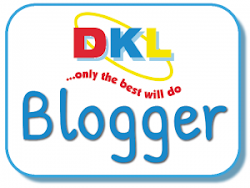 Buy Shaken Udder milkshakes online. If like me you have Family that insist on taking a hot flask to every Family event, why not offer them something different for your picnics this year? 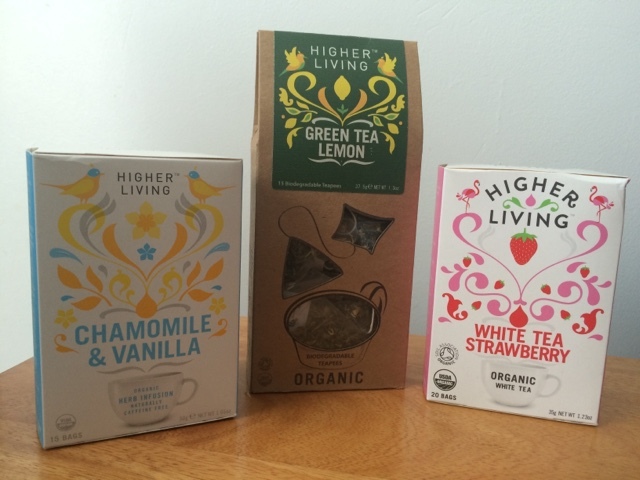 Higher Living Tea has a huge range of delicious teas - definitely something for all tastes. 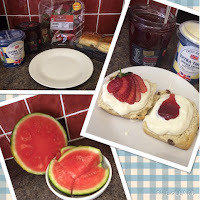 For a summer picnic I suggest a flask of the White Tea Strawberry, beautifully flavoured with a hint of strawberry, it would make a great iced tea too. The Chamomile and Vanilla and White tea with strawberry are both priced at £2.20 & the Green tea with Lemon is £4.79. You can buy your teas from the online shop here. This is the super stylish BRITA Navelia jug, available in blue, green, red, pink, purple and yellow and featuring a lovely patterned lid. As you can see we have the purple colour which has lovely butterflies on the lid. 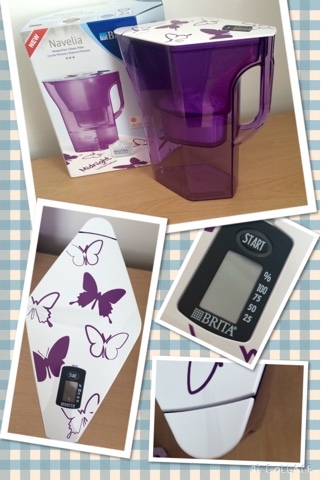 Despite holding 2.3 litres of water (1.3 litres of filtered water) this unique space saving jug easily fits in the door of your fridge - measuring just 26.6 x 21.7 x 11.1 cm. Providing you with soft, great tasting water thanks to the MAXTRA technology, there is even a electronic cartridge exchange indicator on the lid to let you know when you will need to replace your filter. Priced at £19.00 including one MAXTRA cartridge. Launched in 2006, Fairfield Farm Crisps complete every step of the crisp making process on their farm, right from planting the potatoes! These artisan crisps are hand cooked from farm grown potatoes. These Guys can even trace each crisp packet back to the field that the potatoes were grown in! 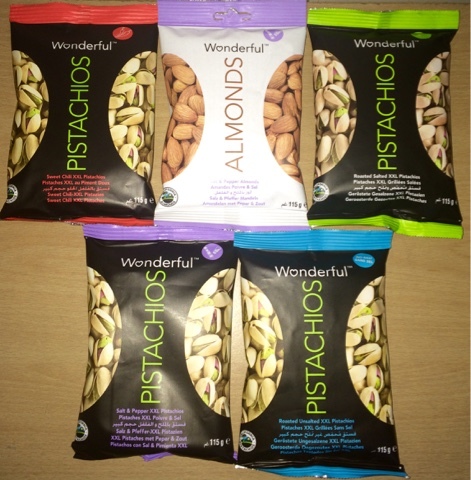 Super crunchy and more-ish my favorite flavour is the Bacon and roast potato, yummy! Perfect for the Adults at a picnic this Summer. Mr Filberts hot air roasted nuts. 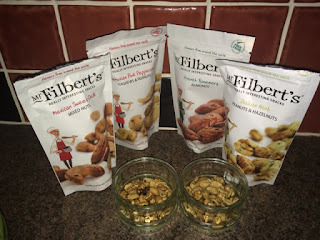 We were kindly sent a selection of Mr Filberts hot air roasted nuts, which I must say, my Husband and I thoroughly enjoyed! Our favorite flavours are the Italian herb peanuts & Hazelnuts & Mexican Sweet Chilli Mixed Nuts. 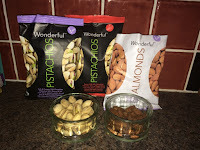 Packed with goodness these nuts make a lovely healthy choice picnic treat. They are roasted using a unique hot air method as opposed to deep frying. Suitable for vegetarians and Gluten free. We were kindly sent four boxes of The Fabulous Bakers Flapjacks for our picnic. 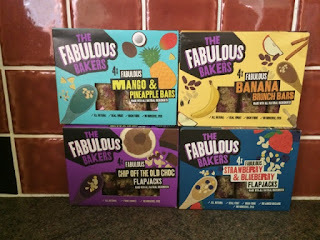 a box of Banana brunch, Chip off the old block, Strawberry & Blueberry and Mango & Pineapple, each contain 4 yummy flapjacks. 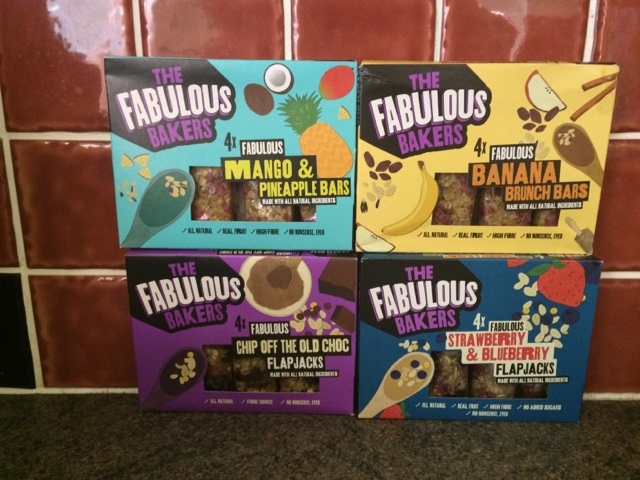 Packed full of natural ingredients and real fruit, these individually wrapped flapjacks went down a storm. Lovely and moist, they are high fibre, suitable for vegetarians and contain no artificial colours, flavours or preservatives. 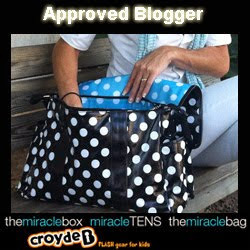 Perfect for picnics, lunchboxes and other occasion you can think of! Liv has absolutely loved shelling and eating these Wonderful Pistachios! I have already had to buy her some more of the roasted unsalted ones, she was so sad when she had finished the first bag that we had tears! Sun-ripened and 100% naturally opened, they only provide you with the largest available nuts that are equally roasted - without adding oil - thanks to their unique roasting technique. 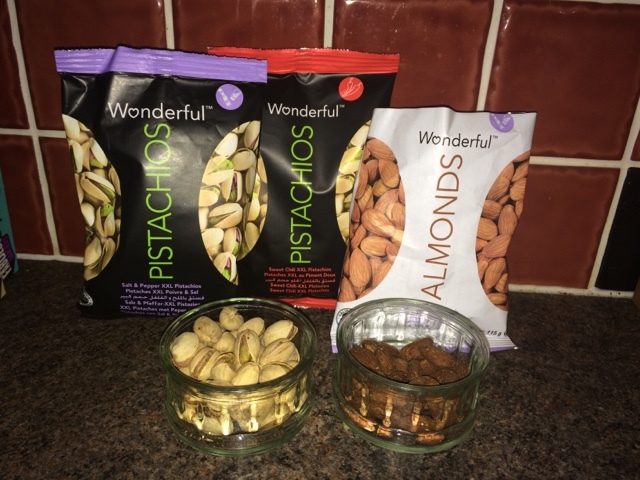 Not only are 30 Pistachios just 100 calories, they also provide you with a whole host of healthy benefits so are great as a healthy snack. Available to buy at Tesco, Sainsbury's, Ocado, Julian Graves, Waitrose and Holland & Barrett. 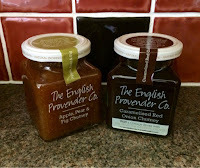 The English Provender Company Chutney. If you are looking to make something impressive for a picnic this year, check out these English Provender Company recipes. I am hoping to get around to making the delicious sounding Caramelised Red Onion Chutney & Goats’ Cheese Sausage Rolls for our next picnic. Until then we will have to thoroughly enjoy the caramelised red onion chutney with some lovely soft brie and crackers! Yummy! 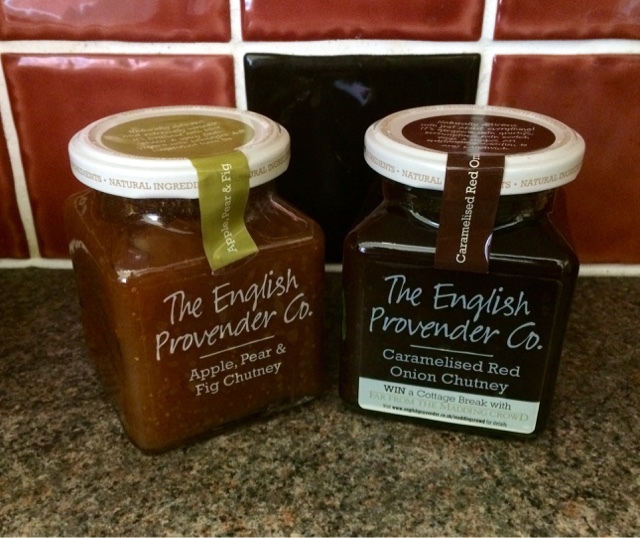 Buy your favourites in the online chutney shop. Secret sausages - vegetables in disguise. 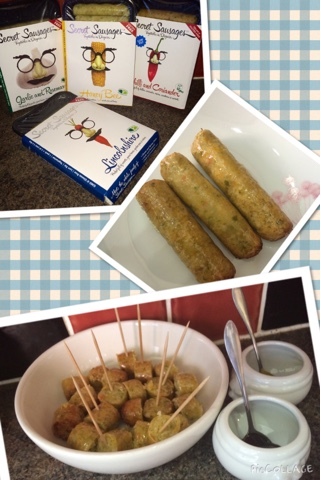 These vegetarian, gluten free Secret Sausages are packed full of flavour and each have their own personality. Tasty, low fat and low calorie, what more could you ask for? They made a great addition to our picnic. I cooked them before hand, allowed them to cool, cut them up and served on cocktail sticks with some dipping options alongside. We were all surprised at just how tasty they were! Lincolnshire - full of carrots, green beans, garden peas & onions. Cumberland - full of onions, green beans, carrots & garden peas. Vegan Chilli & Coriander - full of chilies, coriander, onions, sweetcorn & carrots. Honey Bee - full of sweetcorn, carrots, peas & honey. Cheese & Spring Onion - full of cheese, spring onions, sweetcorn, carrots & mixed peppers. Priced at £3.49 for a pack of 6 and are all gluten free too! A great way to sneak extra vegetables past even the fussiest Children. This Guinness sauce was quite the novelty, with everyone trying it and surprisingly - everyone liking it! A rich, dark sauce made with the smooth unique taste of Guinness® in every bottle. I will admit to being surprised that I enjoyed this sauce! It was very rich and tasted lovely especially with meat/ I think this would make a fantastic marinade in pork chops or ribs before barbecuing - yum! 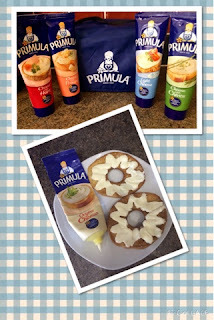 A Family favourite since 1924, did you know that Primula donate all of their profits to charity? When they contacted use to ask if we would like to try a sample I said yes please and was ever so surprised when they actually sent us a selection of their yummy cheeses in the cutest little cool bag. Liv has loved these and had great fun decorating her food before eating it. All of the cheese is gluten free and Primula Original, Light and Chive is also suitable for vegetarians. Available from ASDA, Budgens, Co-op, Heron, Londis, Morrisons, NISA, Sainsbury's, Spar, Tesco, Waitrose and Local Independent Stores. New York Bakery Company - Bagel Thins. 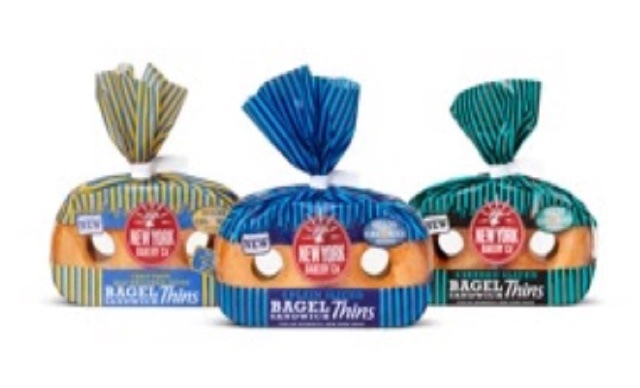 Created with calorie counting bagel lovers in mind, these new bagel thins are under all under 130 calories each - 100 calories less than regular bagels. Pre-sliced for the consumer to allow easy filling, these bagels are perfect for lunchboxes or picnics. Bagel thins are available in Plain, Half plain half wholemeal and seeded. 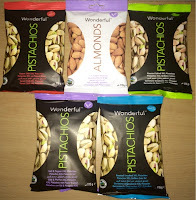 RRP: £1.60 (for a pack of six) Available from Asda, Ocado & Sainsbury's . Godiva Spring Gift Truffles box. Designed by Korean-born artist Eunju Kang, this bright and beautiful gift box is perfect to open at the end of your picnic. Each box is carefully filled with a six of Godiva's beautiful signature truffles. Priced at just £10 these truffles were delicious and didn't last long! Everyone had one and thoroughly enjoyed the rich and creamy truffles. Delicious. Dell'Ugo is the longest established fresh pasta brand in the UK, creating delicious and innovative pastas since 1929. 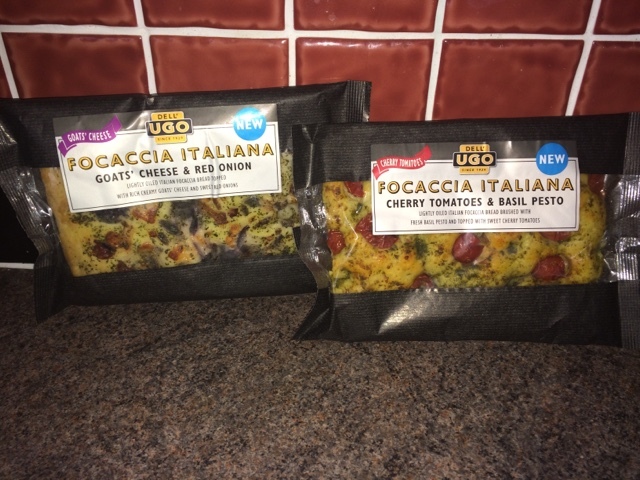 These amazing Focaccia Italiana come in three flavours Goats’ Cheese & Red Onion, Mixed Olive & Tomato and Cherry Tomatoes & Basil Pesto. These light and airy breads are like nothing currently on the market, definitely NOT dense, stodgy or greasy, they even have the traditional baker’s thumb impression on the top! We used one of each at the picnic alongside the cold meats, cheese and pasta, and they were the first thing that disappeared. 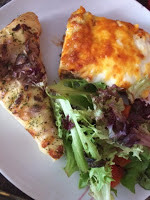 We have since used the other two with pasta and home made lasagna. I have to say they really are fantastic and will definitely be a staple of our fridge from now on. Dell'Ugo products are available in Waitrose, Wholefoods, Costco, and online at Ocado priced at £2.39. Salad spinner & 9 inch serving tongs. This rather elegant looking OXO salad spinner has quickly become my new favourite kitchen gadget. 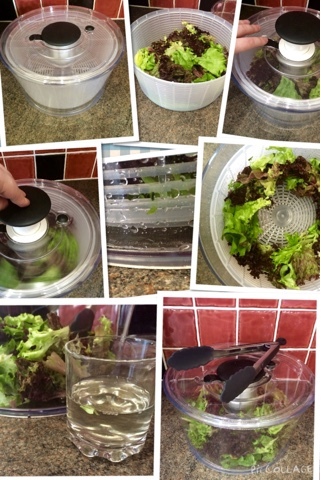 With a removable inner colander, add your salad, rinse well then return the colander to the salad spinner, unlock the pump with the quick release switch and press down the soft non slip pump to start spinning, it really is that easy! Once you are satisfied you have removed enough water, lift the colander out and pour out the water collected in the bottom - I poured mine into a glass to show you just how much it removed! You can then wipe the bowl over with some kitchen towel and return the salad for serving. While the lid doesn't lock closed, the pump can be locked away making the lid flat, ideal for stacking in the fridge or cupboard when not in use. This really has been thought out well. The little touches like the non slip base, brake for stopping the spinner and the lid coming apart easily for quick cleaning really stand this apart from others. Also in the above images, you will see a set of 9 inch tongs with silicone heads priced at £12, the silicone heads are heat resistant up to 310°C/600°F and perfect for protecting nonstick finishes. They are very comfortable to use, can be locked closed for easy storage or can be hung up. Also available in 12 inch. 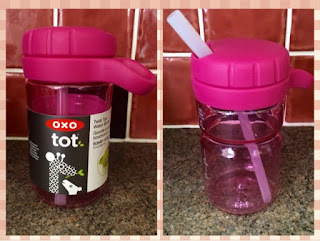 Liv loved this bottle instantly, not just because it is her favourite colour, but she thinks the "magic" straw that vanishes then reappears with a twist of the non slip lid is amazing! She has also taken to swinging it around by the non slip carrying loop so it a good thing it doesn't leak when the straw is tucked away. It also features a lovely soft straw that can't be damaged by her biting on it like other similar bottles. 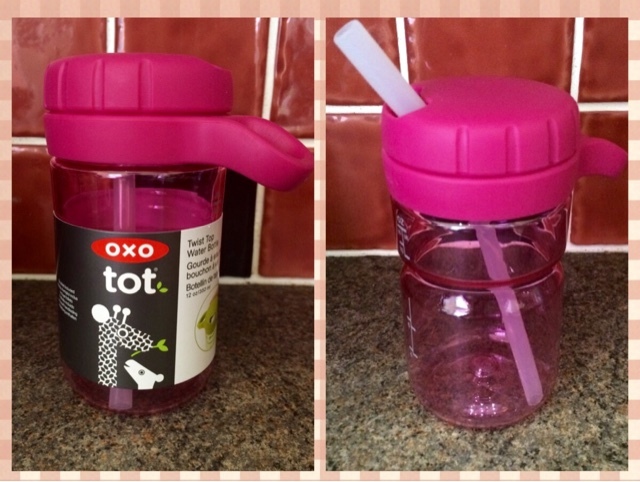 This OXO 300ml water bottle is available in pink, blue or green, BPA free and priced at £8. 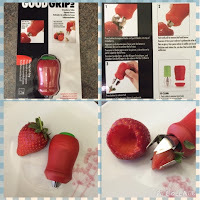 This handy little gadget means you don't have to prepare your strawberries in advance meaning any unused are wasted. It also eliminates the need for taking a sharp knife with you if Children are around. 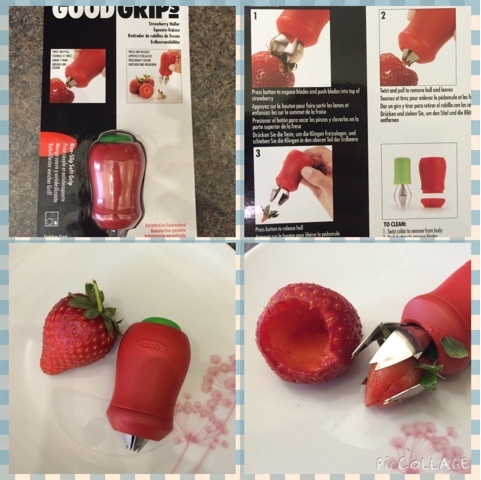 It really couldn't be any easier to use, simply push the button to expose the blades, press into the strawberry over the leaves and hull, twist and remove! It is non slip even when wet, dishwasher safe and comes apart for easy cleaning. Such a simple but brilliant idea! This great OXO strawberry huller is priced at £7. 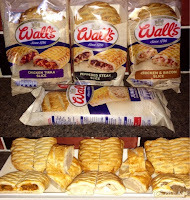 Everyone knows you can't have a picnic without sausage rolls, but why not take it to the next level and offer a selection of lovely Walls pastries? We did and everyone enjoyed them, well they have been making great food since 1786 so you can tryst them on taste. 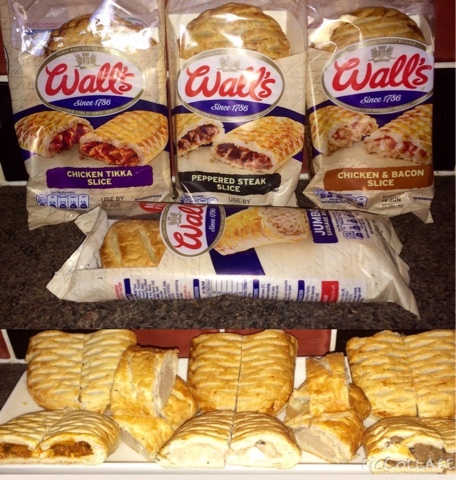 We used 1 Jumbo Sausage Roll, 1 Chicken & Bacon Slice, 1 Chicken Tikka Slice and 1 Peppered Steak Slice, cut up and presented on a tray. Enjoyed by the Adults and Children alike the tray was soon just flakes of pastry! Of course we had to have pork pies too! 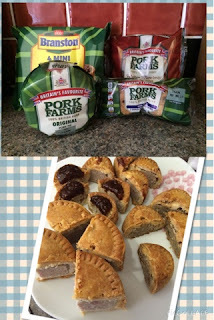 We were sent a lovely selection from Pork Farms including Original Medium Pork Pie, 4 Pack Mini Pork Pies Topped with Branston Pickle, 4 Pack Mini, Melton Mowbray Pork Pies, 2 Pack Snack Pork & Pickle Pies. Established in 1931, Pork Farms has grown to be the Nations favourite brand of Pork Pie and sells over 20 million every year! What would you add to your plate from this selection?